Biertan (German: Birthälm, Romani: Biyertan, Hungarian: Berethalom) is a commune in central Romania, in the north of the Sibiu County, 80 km north of Sibiu and 29 km east of Mediaş. Biertan is one of the most important Saxon villages with fortified churches in Transylvania, having been on the list of UNESCO World Heritage Sites since 1993. The Biertan fortified church was the see of the Lutheran Evangelical Bishop in Transylvania between 1572 and 1867. 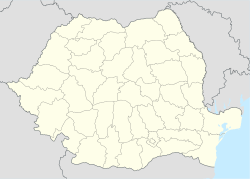 The commune is composed of three villages: Biertan, Copșa Mare (Gross-Kopisch; Nagykapus) and Richiș (Reichesdorf; Riomfalva), each of which has a fortified church. The first documentary testimony about the village dates from 1283 in a document about the taxes paid by the inhabitants of 7 villages and so it is believed to have been founded sometime between 1224 and 1283 by Transylvanian Saxons. The village settlement quickly developed into an important market town and by 1510 Biertan supported a population of about 5,000 people. Between 1468 and the 16th century a small fortified church (die Kirchenburg) was constructed and developed. After the medieval period the town declined in importance with the rise of neighbouring Sighișoara (= Schäßburg in German), Sibiu (Hermannstadt) and Mediaș (Mediasch). In the census of 1930 Biertan had 2331 inhabitants, of whom 1228 were Transylvanian Saxons. During World War II many men were conscripted into the Romanian army and later the Waffen-SS. After the war many Transylvanian Saxons were expelled from the region. Following the collapse of Communism in 1990 many more left for Germany. Today the whole commune has a population of about 2,500 and the village of Biertan alone has about 1,600 people. It is one of the most visited villages in Transylvania, being the historically important place of the annual reunion of the Transylvanian Saxons, many of whom now live in Germany. The "Luna Plină" ("Full Moon") Horror and Fantasy Film Festival takes place in Biertan. It is the only film festival in Romania focused exclusively on horror and fantasy movies. Lock on a wooden door in the church at Biertan. The lock contains 19 locks in one. It won first prize at the Paris World Expo in 1900. Artur Phleps, a Biertan-born military career officer. He, uniquely, served in the Habsburg army of Austria-Hungary, the royal army of Romania and finally the Waffen-SS. Sara Römischer. Although she was not famous in the traditional sense, her story is representative of that experienced by many Transylvanian Saxons in Biertan following the Second World War. Sara was deported to Siberia in January 1945. She survived and after five years returned to her hometown of Biertan to bring up her family through many further hardships. Read an English translation of her harrowing story, or for the original German text in Siebenbürgische Zeitung). According to the 2011 census, Romanians made up 73.8% of the population, Roma made up 17.9%, Germans made up 4.6% and Hungarians made up 3.6%. ^ "Story of a Transylvanian Saxon from Biertan" (PDF). www.transylvaniadreaming.eu. ^ "SbZ - Der Hunger tut weh - Informationen zu Siebenbürgen und Rumänien". Siebenbuerger.de. Retrieved 2013-03-24. ^ "Tabelul 2" (PDF). Retrieved 2013-03-24. Wikimedia Commons has media related to Biertan, Sibiu.